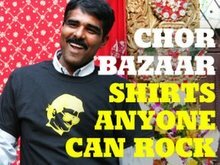 CHOR BAZAAR WORKSHOP: Glen Beck is a Jackass! Glen Beck is a Jackass! Glen Beck's ignorance shines with this December 9th edition of Fox News. He takes on the issue of Americans opting for cheaper medical care in, India over the United States. Of course we would be negligent to gain world knowledge from Glen Beck, let alone India. Sadly there are people that feed off his knowledge and believe that India lacks flushing toilets. That Indian doctors are inferior compared to US doctors. Why the cost of high cost of US health care? "All that money goes to high tech hospitals and doctors that studied at Harvard rather than Gujaro-Raja Medical School"
How about, the Ganges River "sounds like a disease"
Regardless, Glen Beck should watch his back when he is treated by one of the 35,000 Indian doctors in the US. Did you think about that, before you made a fool of yourself?